For keyboard-accessible MENU: Please click here. In 2014 the Lemuel Rhodes Cancer Foundation Fundraising Committee was founded by a group of Bond County, Illinois citizens. The group was originally made up of several teams fundraising throughout the year. While fundraising teams are still active, more emphasis has been placed on generating funds as a committee. As a result, individuals who would like to volunteer their time but are unable to assemble a team are welcome to participate. The LRCF Fundraising Committee closes each year of fundraising with a Dinner for Survivors and a Celebration of Life Event. If you would be interested in helping fundraise or having a team for this great cause please contact us by phone, fax, postal mail, or on Facebook and a member of the Fundraising Committee will contact you. Share our PayPal donation link! Use https://www.PayPal.me/lemuelrhodes in Social Media, Email, Texts, Letters, Cards, Anywhere! The LRCF donates 10% of each fundraising year towards research. In 2018, that amount was $6,500 and is being donated to Siteman Cancer Center in St Louis, earmarked for brain tumor research in honor of Taylor Marti. Luminary Order Form - alternate RTF filetype. Luminaries will be present at the LRCF Celebration of Life Festival and will be acknowledged as part of the event’s closing ceremony. These bags will be lit in honor of loved ones and friends who have had cancer. With your $5.00 donation per luminary, the name(s) of the individual(s) you supply on your completed form will appear on the luminary. Luminary forms are also available at Greenville, Illinois banks. Would you like to find a way to honor caregivers as well? A doctor, nurse, family member, or friend who went above and beyond the call? We can add the phrase “For wonderful care” to any luminary bag. 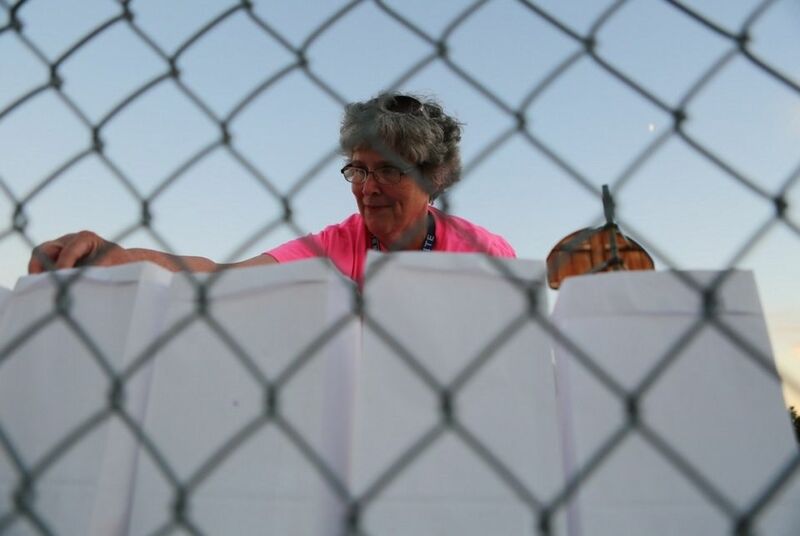 Luminaries through chain link photo courtesy The Greenville Advocate Copyright2015. “Someday we won’t have to worry about cancer. Someday we will live in a cancer-free world. Until that time, the Lemuel Rhodes Cancer Foundation and all who support it will be here for the families.... We will not stop until there is no one who needs our support.... The ones we remember will always light our path.... These luminary bags help us remember each story.” - Jane Wilhite, 2016 Celebration of Life Festival. And we encourage you to think of LRCF when it comes to memorial donations! Funds raised throughout the year stay local, providing financial assistance to Bond County cancer patients and those who receive treatment in Bond County, Illinois. LRCF is a 501(c)(3) tax-exempt organization. Your donations of any amount are tax deductible and will be greatly appreciated! A letter of acknowledgement of donation will be sent to all contributors. You may make an easy and secure online donation to the Lemuel Rhodes Cancer Foundation by PayPal. Donors without a PayPal account can still donate – either by creating an account or paying by credit card on the PayPal website. Simply click the DONATE button below! PayPal does charge us a nominal fee for their services. For larger donations a check would be preferable. AmazonSmile is a simple and automatic way for you to support your favorite charitable organization every time you shop, at no cost to you. When you shop at smile.amazon.com, you’ll find the exact same low prices, vast selection and convenient shopping experience as Amazon.com, with the added bonus that Amazon will donate a portion of the purchase price to your favorite charitable organization. All you have to do is go to smile.amazon.com and select Lemuel Rhodes Cancer Foundation as your charity of choice, and then proceed with your shopping. The AmazonSmile Foundation will donate 0.5% of the purchase price from your eligible AmazonSmile purchases. AmazonSmile: You shop, Amazon gives. LRCF gives financial help and a morale boost to local folks fighting cancer! Join us in the fight! Copyright 2017 Lemuel Rhodes Cancer Foundation. All rights reserved. Web Development & Management by rainofhearts .